When your loved one comes home from rehab, it’s natural to be nervous about what comes next. 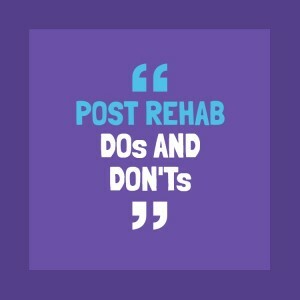 This guide will give you a basic framework for navigating some of the common challenges faced during the post-rehab adjustment period. If you’ve never struggled with drug or alcohol abuse yourself, it can be hard to understand what someone in recovery is going through. However, there are many excellent resources available to help you learn more about the roots of addiction and how to best support your loved one during the recovery process. Start by seeing what resources your loved one’s counselor recommends or by attending a friends and family support group such as Al-Anon. To avoid making your loved one feel as though they’re being put on the spot, remember that a conversation is a two-way street. Make an effort to share details about the activities of your own day as well as your future plans. Your goal should be to foster a meaningful dialogue so it doesn’t feel as though you’re simply lecturing or criticizing. Verbally expressing your support is a good start, but sometimes actions speak louder than words. Show your support for your loved one’s recovery by offering transportation to appointments, the supplies or resources necessary to begin a new sober hobby, or assistance picking out clothes for a job interview. An invitation for a home cooked meal or a drug and alcohol free social engagement are also great options to consider. If you’re not sure how to best be of service, don’t be afraid to ask. “What can I do to help you?” is always a good way to open the lines of communication. Your loved one may have ideas that you never would have considered on your own. Your loved one is well aware of the mistakes he or she has made while struggling with addiction. Focusing on past mistakes will only keep you from moving forward in your relationship, especially if your loved one starts to feel like you’re blaming him or her for what has happened. Nobody can change the past, so it’s best to keep your focus on the future. If you need to process your feelings about past events, vent to a trusted friend or write down your thoughts in a journal. This will help you keep a level head when dealing with your loved one in recovery. Loving a recovering addict can be stressful. It’s easy to spend so much time worrying about how to help your friend or family member that you forget to make time to take care of yourself. But, if you’re exhausted and overwhelmed, you won’t be able to effectively support your loved one during the recovery process. Set a regular sleep schedule, eat nutritious meals, exercise regularly, and make time for stress-relieving activities that you enjoy. You’ll feel better about yourself and be setting a good example for your loved one of how to live a sober lifestyle. Addiction is a chronic illness. Your loved one may be sober now, but he or she is not cured in the sense that addiction will never be an issue again. Just as a diabetic needs to take insulin and manage blood sugar with diet and exercise, a recovering addict needs to remain vigilant to stay on top of relapse triggers. Rehab sets the foundation for a successful recovery. It’s not a quick fix. Always remember that recovery is a journey that must be taken one step at a time. Your loved one may experience obstacles and setbacks along the way, but this does not mean that sobriety is impossible. It simply means that it may take some time to find a treatment plan that works best for his or her individual needs.